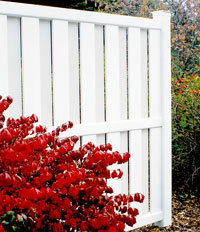 KC Fence Semi-Privacy panels are designed to offer you that little bit of privacy without a closed in feeling. 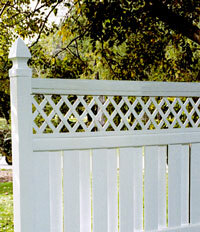 These unique vinyl designs provide a visual screen while permitting air flow.The vinyl fences combine an attractive appearance with the functional safety benefit of no splinters, nails or sharp edges.with lattice accent panel options, there's a fence to complement and add the perfect finishing touch to your outside living space. You're sure to become the envy of the neighbourhood. 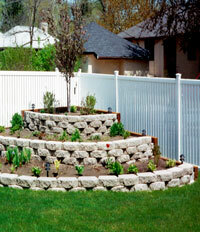 An attractive fence for home or business. Top Rail: 2" x 4" x 95-1/2" - Routed to accept pickets. Picket Spacing: 16 spaces of 2-5/16"
Vinyl Pickets:14 pieces 7/8"x3" and 8 pieces of 7/8"x1 1/2"
Bottom Rail: 2"x4" x95-1/2"- Routed to accept pickets. Includes steel reinforcement channel. Drain holes are pre-drilled. 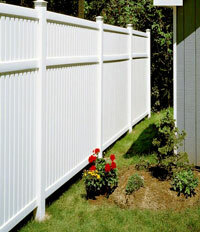 Get the best of both worlds with the Columbia semi-private fence, or for a unique touch of elegance Columbia with lattice placed to provide privacy while maintaining airflow. Top Rail: 3-1/2"x3-1/2" x 94-1/2" - Routed to accept pickets. 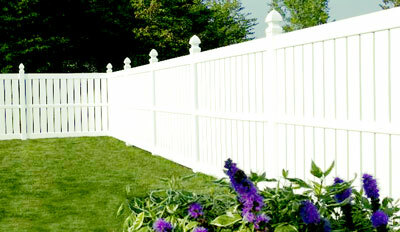 Vinyl Pickets: 17 pieces of 7/8" x 6"
Mid Rail: 3-1/2"x3-1/2" x 94-1/2" - Routed through both sides to accept pickets. Bottom Rail: 3-1/2"x3-1/2" x 94-1/2" - Routed to accept pickets. includes steel reinforcement channel. Drain holes are pre-drilled. Imperial and Imperial midrail semi-private fence meets most local pool codes. Picket Spacing: 27 spaces of 9/16"
Vinyl Pickets: 26 pieces of 7/8" x 3"
Bottom Rail: 2" x 4" x 95-1/2" - Routed to accept pickets. Includes steel reinforcement channel. Drain holes are pre-drilled.